Colin Morgan (left) and Rupert Everett on holiday. It’s not easy being Oscar Wilde. In addition to being hounded in his lifetime by the British government for his homosexuality — if not for his persistent mockery of Victorian society — the late Irish playwright-essayist-poet has had to posthumously endure countless revivals of The Picture of Dorian Gray and Lady Windermere’s Fan, on top of endless tributes by well-wishers. After we’ve conscientiously consumed Wilde (1997, starring Stephen Fry), Ken Russell’s Salome’s Last Dance, Monty Python’s uproarious “The Oscar Wilde Sketch,” and filmmaker Alexander Payne’s cameo impersonation delivered on Wilde’s tombstone in Paris, Je T’aime, we have no choice but to look at Rupert Everett’s brand new The Happy Prince. We’re happy we did. Actor Everett, who wrote, directed, and stars as Wilde in the gloomy last act of his subject’s life, conducts a sort of cinematic séance over the celebrated bad boy — a stream-of-consciousness deathbed run-through of the gauntlet Wilde faced after getting out of prison in 1897. Scenes of his unhappiness only remind us of what kind of trickster we’re dealing with. Wilde’s scrapes are just as invigorating as his triumphs, mostly because we don’t have to face them ourselves. He’s the original outrageous coaster. With apologies to the National Lampoon, “Drunk Stoned Brilliant Dead” describes Wilde to a tee. 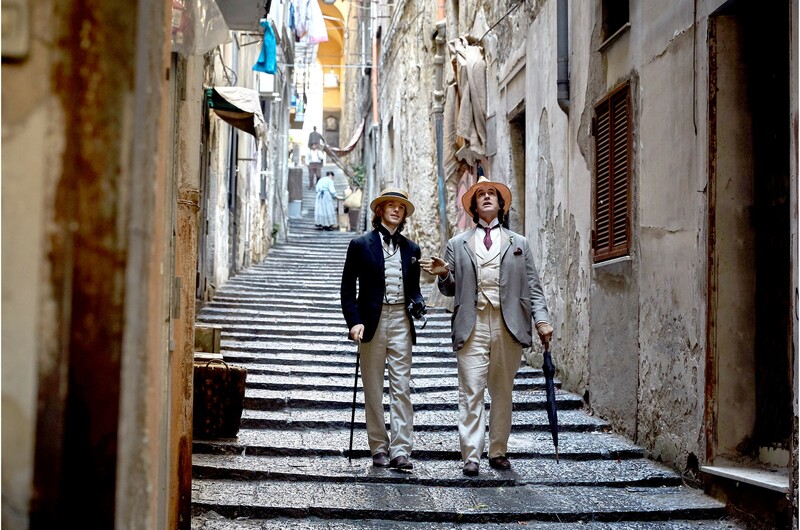 Poor but notorious, Wilde gets kicked out of some very picturesque places in Dieppe, Naples, and the slums of Paris. While he’s commiserating with his agent (Edwin Thomas) and his dramaturge pal (Colin Firth), he’s also chasing a succession of street urchins and young waiters. Memories of his golden-haired upper-crust fave Bosie (Colin Morgan) remain uppermost in what is left of Wilde’s mind, tattered by years of absinthe and cocaine. But what truly delights Wilde is reading his children’s short story “The Happy Prince” to the nearest boy or girl, with no ulterior motive except to summon up his own inner child. Everett is deliriously good as the poet, floating on a cloud of gorgeous cinematography by John Conroy and Gabriel Yared’s floridly romantic music. This Wilde kingdom is almost attractive enough to make us forget about the hypocrisy and class-conscious cruelty that were his lifelong nemesis. Bloody, ironic, and worth a look.